One of the most recent studies on psychosomatic cancer therapy comes from Germany. Over the past ten years, medical doctor / surgeon Ryke Geerd Hamer has examined 20,000 cancer patients with all types of cancer. Dr. Hamer wondered why cancer never seems to systematically spread directly from one organ to the surrounding tissue. For example, he never found cancer of the cervix AND cancer of the uterus in the same woman. He also noticed that all his cancer patients seemed to have something in common: there had been some kind of psycho-emotional conflict prior to the onset of their disease - usually a few years before - a conflict that had never been fully resolved. X-rays taken of the brain by Dr. Hamer showed in all cases a dark shadow somewhere in the brain. These dark spots would be in exactly the same place in the brain for the same types of cancer. There was also a 100% correlation between the dark spot in the brain, the location of the cancer in the body and the specific type of unresolved conflict. On the basis of these findings, Dr. Hamer suggests that when we are in a stressful conflict that is not resolved, the emotional reflex centre in the brain which corresponds to the experienced emotion (e.g. anger, frustration, grief) will slowly break down. Each of these emotion centres are connected to a specific organ. When a centre breaks down, it will start sending wrong information to the organ it controls, resulting in the formation of deformed cells in the tissues: cancer cells. He also suggests that metastasis is not the SAME cancer spreading. It is the result of new conflicts that may well be brought on by the very stress of having cancer or of invasive and painful or nauseating therapies. Dr Hamer started including psychotherapy as an important part of the healing process and found that when the specific conflict was resolved, the cancer immediately stopped growing at a cellular level. 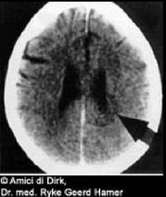 The dark spot in the brain, referred to by Dr Hamer as a 'Hamer Herd' shown in the picture below, started to disappear. X-rays of the brain now showed a healing edema around the damaged emotional centre as the brain tissue began to repair the afflicted point. There was once again normal communication between brain and body. A similar healing edema could also be seen around the now inactive cancer tissue. Eventually, the cancer would become encapsulated, discharged or dealt with by the natural action of the body. Diseased tissue would disappear and normal tissue would then again appear. According to Dr Hamer, the real cause of cancer and other diseases is an unexpected traumatic shock for which we are emotionally unprepared.